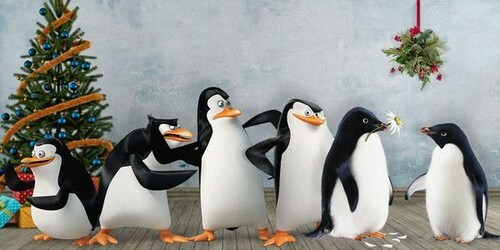 Monty, Mabel, and the Penguins of Madagascar. Monty (left Adélie) was the first of the guys to get Mabel under the mistletoe. Monty and Mabel are penguins featured in the UK department store John Lewis's 2014 क्रिस्मस advertising campaign (a link to their cute commercial in the comments).. Wallpaper and background images in the पेंग्विन्स ऑफ मॅडगास्कर club tagged: photo penguins of madagascar monty the penguin mabel the penguin john lewis john lewis christmas advert mistletoe. This पेंग्विन्स ऑफ मॅडगास्कर photo contains सम्राट पेंगुइन, एप्टीनोडाईट्स फ़ोर्सटेरी, एफ़्नेडाइट्स फोस्टर, and aptenodytes forsteri. There might also be रॉक हॉपर, कलगी पेंगुइन, क्रिस्टेड पेंगुइन, रॉक हूपर, कलगीदार पेंगुइन, and पेंगुइन. That is the most adorable commercial I've ever seen in my life.